Hello Friends, In honor of Secretaries day a little over a week ago, I made butterfly boxes to give to all the secretaries at both my hubby’s school and my school to let them know we appreciate them. My hubby said his secretaries were almost in tears as he was the only one in the entire school that acknowledged them. How sad is that. They came out really cute and of course they are filled with chocolate. 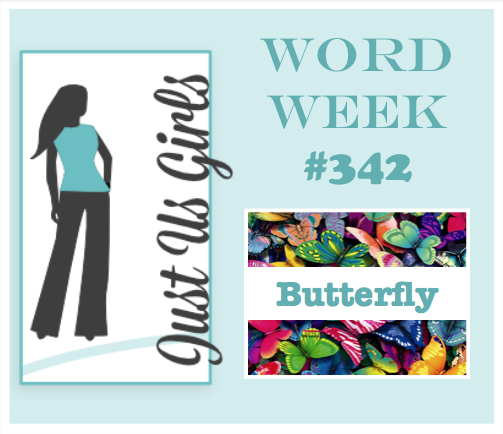 I knew this butterfly challenge was coming up at Just Us Girls and thought they would be perfect. 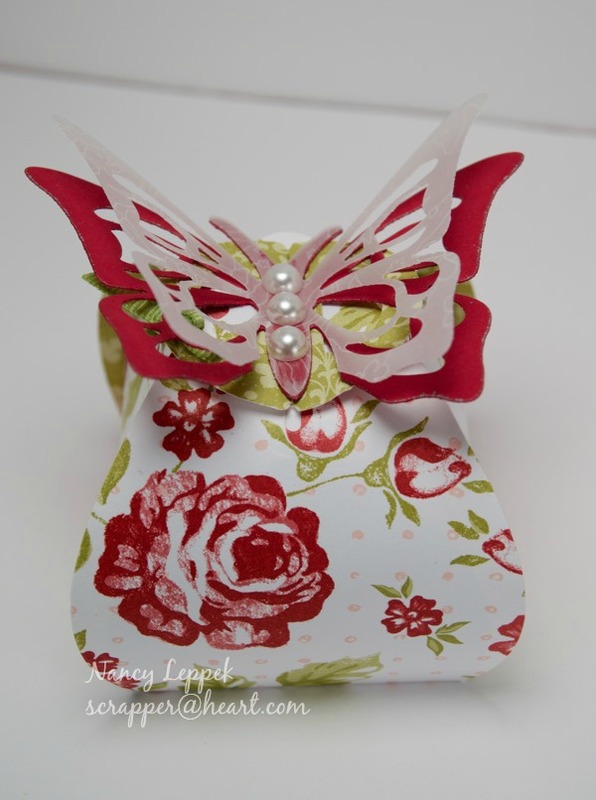 The box is from Stampin Up and is called the Curvy Keepsake Box and the butterfly die is from Savvy Dies and is punched out of cardstock and decorative vellum as well. The vellum is gorgeous, I wish you could see it. They all have tags on the sides that say for you, but you can’t see them in the photos….I was a tad rushed. Please come over to Just Us Girls and see what the talented team and our New Guest Designer Aileen has done! Welcome Aileen!! While you are over there, consider breaking out those butterflies and joining us this week, we would love to have you! Take care, Nanc’ Happy Mother’s Day too! Here is a pic of the rest of them. Categories: Cards | Tags: Card making, Cards, gift boxes, rubber stamps, Stamping Up | Permalink. 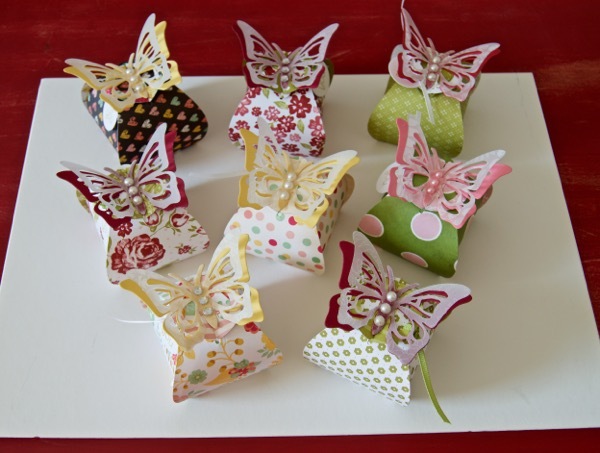 Nancy, I love these little butterfly gift boxes, they look so cute. Brilliant die cuts and colours. Beautiful little butterfly boxes. I love them. The one with the rose paper is my favorite. Happy Mother’s Day to you my friend. Have a wonderful weekend. These little treat boxes are absolutely adorable! LOVE the butterfly toppers you added to them! Nancy, these are so pretty and such a lovely and thoughtful gift for the secretaries. These are so adorable! Love the fun shape and the pretty colors. Bet they were a big hit with all of the teachers. These are so super cute and what a lovely gift of appreciation for the secretaries as well. How spoilt were those Secretaries! I bet they were overjoyed when they received such beautiful personal gifts with CHOCOLATES! They are just fabulous Nancy. How nice of you to acknowledge Secretaries Day with these adorable butterfly boxes! I love all of the different patterns you used on these adorable little boxes. Nancy, those boxes with the butterflies on top are adorable! And you made each one unique…. and filled with chocolate…you are the best ever!! Have a fabulous week back home! How thoughtful of you, Nancy. They turned out lovely. What gorgeous little butterfly boxes! How wonderful. Oh my gosh, you are the BEST wife ever!!! And don’t you just LOVE a project like this. My favorite thing to do in the world is make little boxes as favors or gifts. These are so stinkin’ CUTE, I bet the recipients just loved them What a great take on the challenge!! !